Ancient Guatemalan tribes believed that if they told their worries to tiny dolls and placed them under their pillows at night, the dolls would take care of all the worrying for them and then their dreams would come swiftly and be care-free. Your child can make his own out of clothespins and fabric, and then set his own troubles away! This project blends a unique sense of history and tradition and teaches your child about a different culture and belief. He will be using his own imagination in creating these dolls and perfecting his artistic skills at the same time. 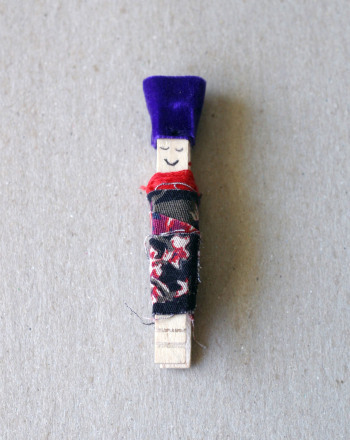 Start by asking your child whether his worry doll is going to be a boy or a girl. Let him then decide what colored clothing his person will be wearing. Let your child cut out a shirt, pants, or a skirt for his doll, and then help him to glue these pieces of clothing to the clothespin. Remind your child that the prongs will be the 'legs' of their doll. Let your child cut out arms for his person and glue those to the shirt. Ask your child if his doll will have any hair. For long hair, he can glue on pieces of colored string. For shorter hair, he may want to colour the top with markers. Now it is time to let your child draw a face on his worry doll! Let him decide what kind of expression his person will have. With his doll complete, when it comes time for bed, ask your child just what is on his mind that he would like to tell his worry doll. Let him whisper it into his doll's ear and then tuck the doll under his pillow. Let your child know that he will now have dreams filled with only happy thoughts, just like the Guatemalans of the past! Kids colour and cut out a native costume for a paper doll, then guess what country the doll is from. Hint: The capital city is Berlin. 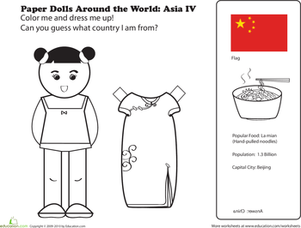 Kids colour and cut out a native costume for this paper doll, then guess what country the doll is from. Hint: The capital city is Tokyo. Kids colour and cut out a native costume for this paper doll, then guess what country the doll is from. Hint: The capital city is Nairobi. 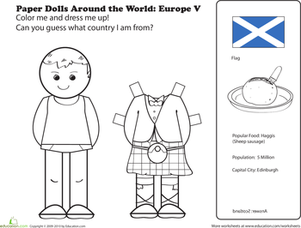 Kids colour and cut out a native costume for this paper doll, then guess what country the doll is from. Hint: The capital city is Dublin. 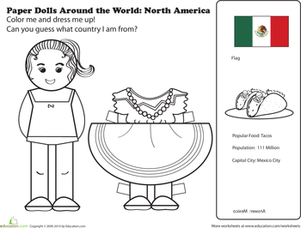 Kids colour and cut out a native costume for this paper doll, then guess what country the doll is from. Hint: The capital city is Edinburgh. 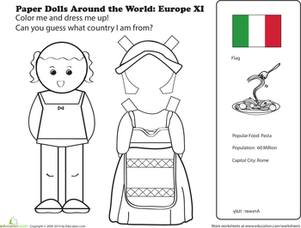 Kids colour and cut out a native costume for this paper doll, then guess what country the doll is from. Hint: The capital city is Paris. 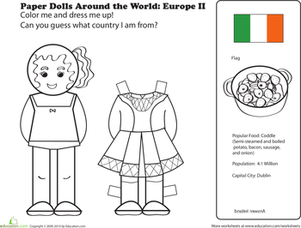 Kids colour and cut out a native costume for this paper doll, then guess what country the doll is from. Hint: The capital city is Beijing. 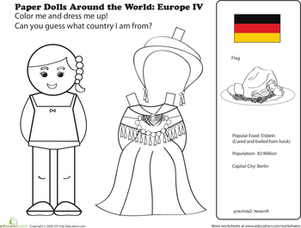 Kids colour and cut out a native costume for this paper doll, then guess what country the doll is from. Hint: The capital city is Rome. 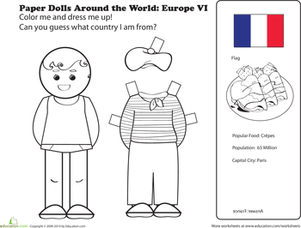 Kids colour and cut out a native costume for this paper doll, then guess what country the doll is from. Hint: The capital city is Mexico City. Kids colour and cut out a native costume for this paper doll, then guess what country the doll is from. Hint: The capital city is New Delhi. This stocking craft will get your child to make a fun and textured collage for Christmas. 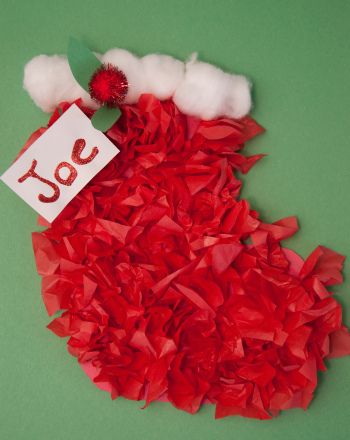 Make this stocking craft with your child this holiday season. This Christmas wreath craft is a simple activity for the holiday season. Make this Christmas wreath craft with your child this winter.